If you have problems with the double-click speed in Windows 10, these can be resolved pretty quickly, this solution is also for Windows 8.1 and Windows-7! This can be adjusted very quickly, this solution is also suitable for the Windows 10 / 8.1 / 7 desktop PC but also as an example for administrators of Windows Server 2012/2016 suitable, as well as under MAC OS of Appel will be synonymous with Microsoft Windows not left you alone with this problem! 1.) ... Individually customize the double-click speed under Windows! 2.) ... Solution for problems with often changing of mouse pointer speed? 3.) ... Why does it happen again and again to adjust the mouse settings! See also: ► Fax and scan is suddenly gone! 1.) Individually customize the double-click speed under Windows! If you want to change the Mouse double click settings, please open the Mouse Properties in Windows 10. The simplest way is, over the Command: control.exe /name Microsoft.Mouse. Start the Windows 10 Run Dialog via Windows-Logo+R keyboard shortcut and enter the command control.exe /name Microsoft.Mouse or main.cpl. Please select the Tab Buttons and customize the Mouse double click speed! 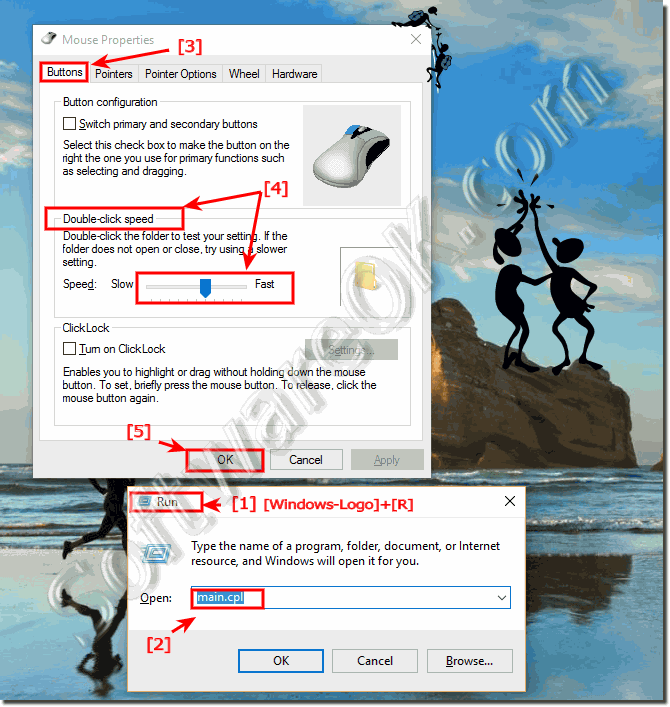 (Image-1) Windows-10 mouse double-click problem! 2.) Solution for problems with often changing of mouse pointer speed? The automatic hold-the-mouse speed feature for Windows is the right desktop tool if mouse speed changes frequently! ► ... a free tool to keep the mouse speed on Windows! With an automatic Keep Mouse Speed feature for Windows, it is the right desktop tool if the Mouse Speed change often! 3.) Why does it happen again and again to adjust the mouse settings! It's not that you want to annoy Microsoft, either a new driver was automatically installed or one of the apps from the store or an installed program unintentionally affects the mouse. On some days you are also a bit tired / sluggish and feel that everything is going a bit too fast, but you have the customization options for Windows. See also ► KeepMouseSpeedOK ► Where is the classic calculator in Windows 10?